Miss G’s two biggest assets must be her heart and imagination. With both of these things she has singlehandedly spawned a fantasy world where anyone can be a princess, warrior, sea serpent, goddess, or anything they want simply by donning one of her fanciful headpieces. Looking at her extravagant creations, you would never know that she has no fashion, art, or design training to speak of. If anything, her lack of training contrasts with her dynamite execution and makes her detail work even more impressive. "I'm not some big fancy designer; I'm just a silly girl making headpieces out of my home studio… If anyone had told me I would be living in LA and making custom headpieces for celebrities, I would have told them they were crazy!" Miss G is Caley Johnson, a Colorado native who grew up surrounded by the peaky mountains of Denver. Growing up she had little interest in design or fashion, although she loved crafting and getting her hands dirty. Hollywood dreams couldn’t have been further from her mind after graduation when she spent her time studying natural medicine, assisting at births as a doula, performing with a local belly dancing troupe, and saving up money to travel from nanny jobs. She fell in love with travel, and began to take long trips abroad. She traveled across Europe, Australia and New Zealand. She spent a season working in Singapore. She also volunteered for months at a hospital in Tanzania, where she was thrust into the role of a doula and midwife. "That was one of the most intense experiences of my life! I was trained as a doula – not as a doctor or midwife – and yet there I was delivering babies in Tanzania." Caley’s international excursions came to a halt when she finally discovered her love for self expression through fashion at Burning Man in 2006. Her outfits became more and more flamboyant, and she found that her colorful, insane and nonsensical outfits brought smiles and giggles to everyone she encountered. "I made myself horribly uncomfortable in those clothes, but people would be so happy to see me that it was worth it!" On a limb, she moved to San Francisco in 2009, and, inspired by the vibrant scene, began to make party outfits for her friends in her basement. "I would repurpose bed sheets and interesting found fabrics, and create wide-legged pants with faux fur cuffs and matching bra tops. All of the typical festival clothes were only for petite women, and I wanted to make clothes that ANYONE could wear, including my mommy friends! I wasn’t a seamstress at all but I loved creating these happy clothes for the people I loved." She named her small design business Miss Giggle Monster – one of her nicknames from a nanny charge - and began to break into the San Francisco scene in earnest. First she began with trunk shows and street festivals, and then was sharing the runway in the city’s active underground designer scene. "I never got into mainstream high fashion. I was most inspired by my friends in extravagant costumes and by other designers in San Francisco. Gelareh “discovered” me at trunk show and I was so star-struck! I also loved Miranda Caroligne’s work and the fact that she, like me, would make everything herself by hand." Her focus on bright playful clothing began to shift to fascinators and headpieces. 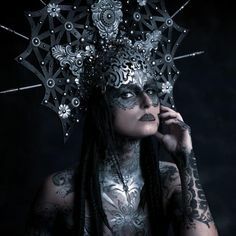 As she learned more and more about the art of headpiece making, she realized it was time to get serious, and with a name like Miss Giggle Monster, who would take her seriously? In 2012 she changed her name to Miss G Designs, and started making plans to move to the only place that she could really immerse herself in her craft. Caley moved her home and studio to Los Angeles, where she lives and works today. What started as a hobby has become both a career and an obsession. Her headquarters is her home, and her dining room table is covered with half finished projects. Her guestroom is her storage room, and is stacked floor to ceiling with boxes of craft supplies. "I can’t have people over! I have no house! I live in my studio surrounded by my art, but I’m honestly just happy I have sunlight to work in. In San Francisco my studios were in dark basements and it wasn’t very inspiring." Caley works nonstop on her creations seven days a week, except for every other Wednesday, when she takes off the evening for one of her favorite activities: making others smile. She and small dedicated crew ride their bikes to Skid Row, home of California’s largest homeless population, to pass out over two hundred fresh burritos they make by hand, clean water, and chocolate. "The Burrito Project* is honestly the only time I get away from work! I get to be outside on my bike with really wonderful people. Everyone gets so excited to see us. It makes me happy. My favorite things in the world are making hats, traveling, and volunteering." Everything that Caley does she does with all of her heart and both of her hands; whether it is making burritos or creating a gigantic custom tentacle-clad squid headpiece. 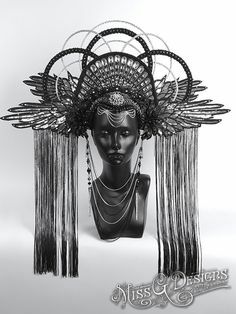 Caley has personally made hundreds of headpieces that have graced the heads of countless festival-goers, children, mothers, models, drag queens, gypsies, and dreamers. They have been worn by the likes of Katy Perry, Gwen Stefani, Kesha, Neon Hitch, Empire of the Sun, Selena Gomez, Tyra Banks, Emmy Rossum, and Busy Philipps. She finds inspiration for new ideas everywhere, and her designs are constantly evolving. In her work you can see influences from Russian monarchs, Aztec warriors, Disney princesses, and even Hannibal Lecter! True to her roots, every one of her pieces is a genuine original, made from scratch, with Caley’s personal touch. Just like her designs, Caley is truly one of a kind. 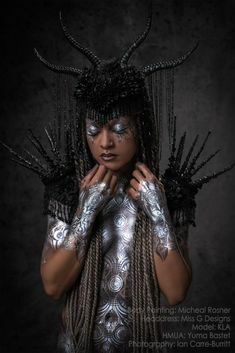 When you purchase one of her exotic creations, you are not just completing your outfit; you are supporting an artist, investing in an authentic piece of wearable art, and validating a crazy dream from a girl that was once called Miss Giggle Monster. "I want anyone to be able to feel like a rockstar! My headpieces are for everyone, regardless of their gender, age, body type; anyone can put one on and have a complete transformation! I just can’t believe that I get to do this every day and make a living! How wonderfully silly my life is…. Thank you to everyone who has inspired and supported me!" *If you would like more information about donating or volunteering with The Burrito Project, please click here.